Placing a photo or creating text might technically complete your design, but Adobe Photoshop can do so much more. So, why not add some effects? Sure, a degree in graphic design will probably give you the tools to really jazz up a Photoshop design, but in reality you can spruce up your projects with just a few clicks. That is, if you know which buttons to press. A drop shadow effect can add depth to a photo or text by adding, you guessed it, a shadow beneath a layer. It may not seem like much, but this effect can add subtle definition to your design. Just as in real life, a shadow needs to be cast from something–a person, a building, anything that blocks light. This means that before placing a drop shadow, you need something to give a shadow to. 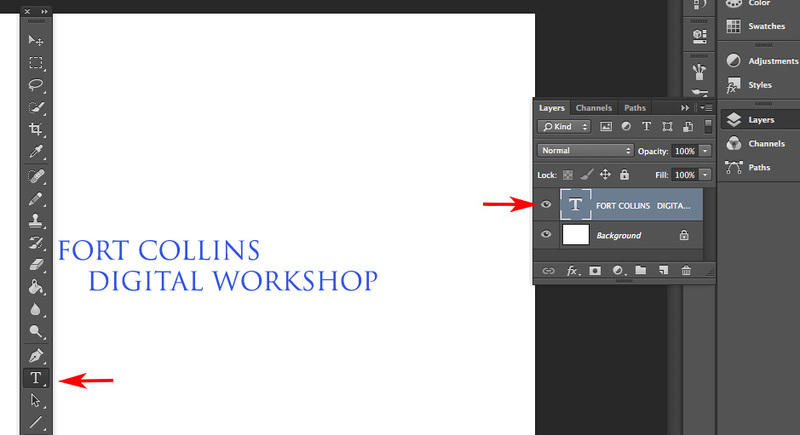 Like the beginning of most designs, this merely requires you to place an image or text in your document. Here, we will work with text, but the process will be virtually the same. Start by selecting the Type tool in Photoshop’s Tool Palette. Then, write some text by clicking within the document to create a text box. This text box will become a new layer, which you will notice in the Layers Panel. Like Peter Pan in the 1953 classic Disney movie, you can now “sew” your shadow onto the boots of this text layer. Note: For more on creating layers and basic designs, read our “Honing Adobe Photoshop Skills: Creating Memes” and “Adobe Creative Suite: Introduction to Layers” blogs. Finding the Drop Shadow effect can be a bit tricky if you don’t know where to look for it. In Photoshop’s main navigation, select Layer > Layer Style. 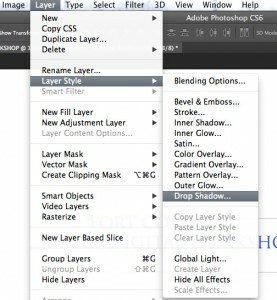 From the Layer Style submenu Drop Shadow will be among the available tools. Note: If finding tools in Photoshop’s navigation troubles you, read our prior blog, titled, “Adobe Photoshop Menu Bar Tutorial: Using Logic to Find the Function You Need.” Here, you will find a rationale behind some of the popular tools you’ll use in Photoshop and other Adobe Creative Suite programs like InDesign and Illustrator. 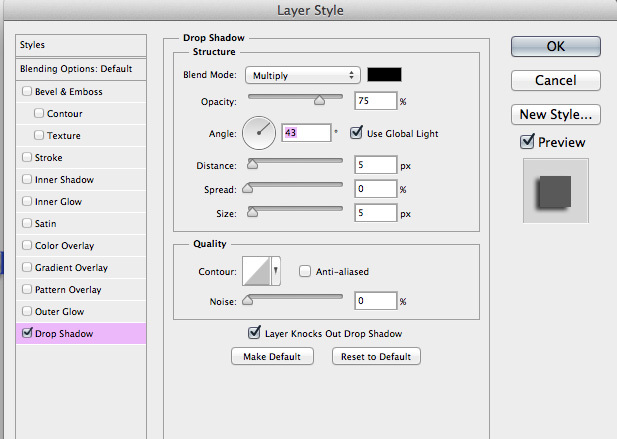 Without delay, the Layer Style box will pop up, and the Drop Shadow tool will be open and ready for your customizations. Also, you may notice that under this box, your text already has a drop shadow. If you like the effect, you’re done! However, many of the tools in this Layer Style box are easy to use and grant you great control over the drop shadow’s features. For instance, the Angle tool lets you select where the light source comes from. Changing the angle will shift the drop shadow, all the while staying tethered to the text. Distance, Spread and Size sliders allow you adjust the distance of the drop shadow from the text; the boldness of the drop shadow and the surface area the shadow covers, respectively. These tools will be more than enough to get you started, but feel free to play with other tools. If you don’t like the effect, you can hit Cancel at any point and restart. Now that you understand drop shadows, there should be no fear in exploring how this effect, or other effects for that matter, can make layers and your overall design distinctive. After all, every person casts a unique shadow. Wouldn’t you want your Photoshop designs to be the same way?